PRODUCT: #LA25-275 Adjustable Lead Pipe Flashing, 2-3/4 inch ID x 12 in. Riser fits 2 Inch Pipe. 2.5 Lb. Lead, 16 X 16 inch Base. Price/Each. SIZING: Fits 2" pipe (2.375" O.D. penetration). 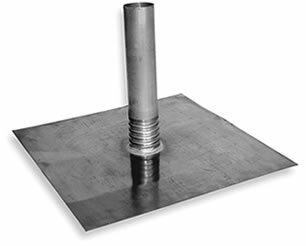 L-series large 16 x 16" base with ADJUSTABLE lead pipe flashings provide a watertight seal completely protecting roof penetrations and are recommended for all types of roof pipe penetrations.